After offering a secret password to the behatted gent on the door (something about whether he'd be kind enough to warm my muff), my friends and I stepped through a secret gate and fell headlong into Victorian London where we walked along an eerily quiet makeshift street and found refuge at The Queen Victor pub. Located within a dark and musty old railway arch, the pub was heaving with interesting punters. This is Leyshon Brothers Bonded Warehouse. A fantastic pop-up venture which is destined to disappear at the close of 2012. The hospitable innkeeper served us enamel mugs of dandelion & burdock and ginger beer; jam jars of gin, and bottles of Tangle Foot beer. We found a pew in the corner at a wooden table made from an old barrel top and supped our refreshments as we sang along heartily to someone belting out old classics on the piano. A couple of local Victorian ladies mingled amongst the tables offering chat and a secret game of poker. 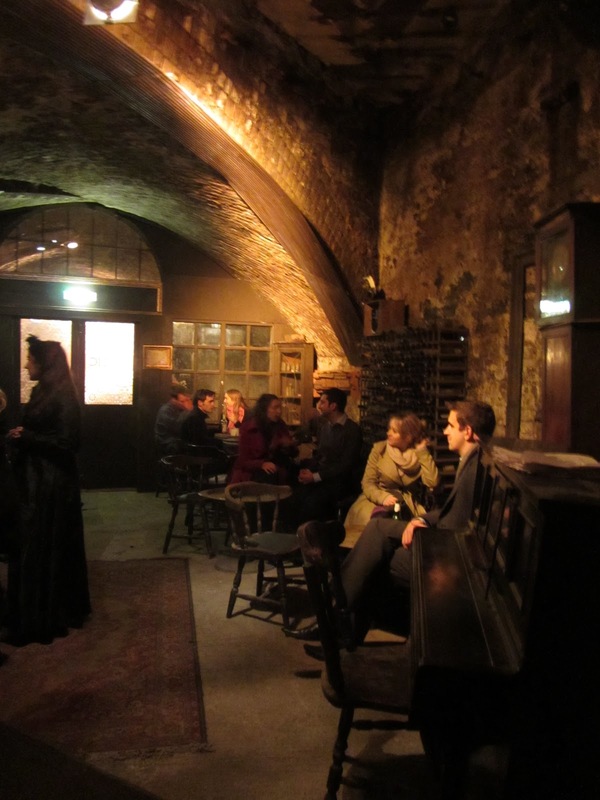 As well as hosting legendary Victorian pub nights, there are all sorts of unusual events to be found at Leyshon Brothers Bonded Warehouse, including Music Halls Nights and Tweed & Lace Parties where street games, magicians, jugglers and comedy acts can all be found. There is even an 'End of the World is Nigh' bash on 21st December (ask the Mayans) And as a Leyshon Brothers grand finale, they're putting on the mother of all knees-ups with a fantastic New Year's Eve bash on 31st December. Bawdy behaviour and dressing up in Victorian garb is very much encouraged (but not compulsory). The whole concept is brilliant and I really hope there's a chance that Leyshon Brothers will be able to continue their venture into 2013. It's the most ideal place to while away a cold, winter's evening.